Around 50 talented artistes and groups from different parts of the State attended the audition of the North East Got Talent Season 4 at Nepali Sahitya Parishad Bhawan in the Development Area of Gangtok on Monday. This multi-talent reality show has been presented by Sanchita Production. The audition has renowned singer Remanti Rai, filmmaker and actor Sanchita Talukdar, who is also the director of the show, and concept and project head of the show, Jyoti Kakati as judges. The audition was an opportunity for the young artistes to explore their hidden talents on television. 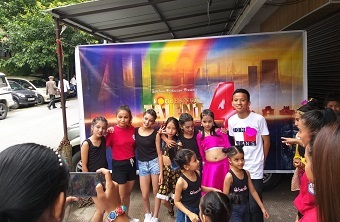 The audition was conducted to bring out talents for the popular multi-talent reality show ‘North East Got Talent Season 4 for Mr, Miss, Kids and Mrs titled ‘North Northeast’s New Top Model’. “The audition was held at Sahitya Parishad Bhawan, Development Area in Gangtok from 10 am onwards,” informed sources. It has been informed that the shortlisted candidates from the audition will be invited to Guwahati for the next round.